Suggah™+ is an ultra-rich, ultra-emollient conditioning formula that helps to deliver instant moisture to smooth and soften your lips. Unlike other lip soothers on the market, whose main ingredient is petroleum or wax, this main ingredient is Shea Butter, which has been used for centuries to help protect and soften the skin. Fortified with Maxi Lip™, an ingredient that is specifically developed for its intense hydration properties that deliver a power pack punch of moisture to the lips that result in a fuller appearance of the lip line. SUPERCHARGED with Tropical Fruit Harvest™ and Yogurt Extract for mild exfoliation, nutrition and superior hydration, moisture is restored and surface lines appear reduced creating a more youthful, kissable lip. Bestseller! Come on baby ... gimme some Suggah!!! Helps to restore softness and comfort. Helps to improve the appearance to the vermilion border. Soothes, protects and provides superior hydration. Skin Type: Suitable for all skin types, especially those with sensitive skin. 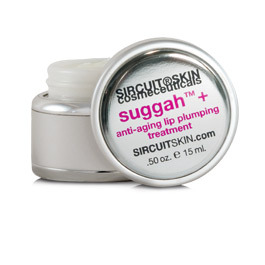 How To: Apply Suggah™+ plumping treatment to lips and vermilion line morning and night only. Not to be used as a lip balm. Jojoba Oil (Organic): A moisturizing emollient with properties that help minimize moisture loss improving skin hydration leaving skin feeling soft and smooth. Cocoa Seed Butter: An emollient that is excellent for improving the condition of dry, chapped lips. Sodium Ascorbyl Phosphate: An antioxidant and a stable pre-cursor to Vitamin C.
Yogurt Extract: Rich in protein and widely recognized for its health benefits, this mildly exfoliating extract provides moisturizing properties that work to hydrate the stratum corneum and decrease trans-epidermal water loss, thus increasing the smoothness and softness of the skin. Tropical Fruit Harvest™: A bioactive complex derived from Mango, Papaya and Pineapple that helps deliver instant moisture to rejuvenate and soften the lips and is the ideal remedy for relieving dry lips. Coffee: An antioxidant that helps to defend the skin against harmful free radicals in the environment while helping to promote the skin’s overall quality and appearance. Green Tea: From the most potent part of green tea, this powerful antioxidant has known anti-aging properties that help to leave skin feeling soft and smooth. Caffeine: An antioxidant that provides anti-aging benefits to encourage beautiful skin. Maxi-Lip™: A stabilized, natural peptide that helps to moisturize the lips and can appear to make them look firmer, smoother and better defined. 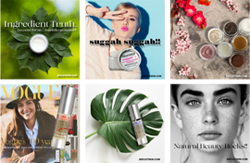 Formulated With: Butyrospermum Parkii (Shea) Butter, Simmondsia Chinensis (Jojoba) Seed Oil*, Theobroma Cacao (Cocoa) Seed Butter, Hamamelis Virginiana (Witch Hazel) Water, Sodium Ascorbyl Phosphate, Natural Additive (Sweetener), Ricinus Communis (Castor) Seed Oil, Yogurt Extract, Carica Papaya (Papaya) Fruit Extract, Mangifera Indica (Mango) Fruit Extract, Ananas Sativus (Pineapple) Fruit Extract, Coffea Arabica (Coffee) Seed, Camellia Sinensis (Green Tea) Leaf Extract, Caffeine, Hydrogenated Castor Oil, Palmitoyl Oligopeptide, Ethylhexyl Palmitate, Tribehenin, Glycerin, Alcohol Denat., Sorbitan Isosterate, Aqua (Water), Fragrance/Parfum+ (natural). *USDA Certified Organic | NOP. Phthalate-free.